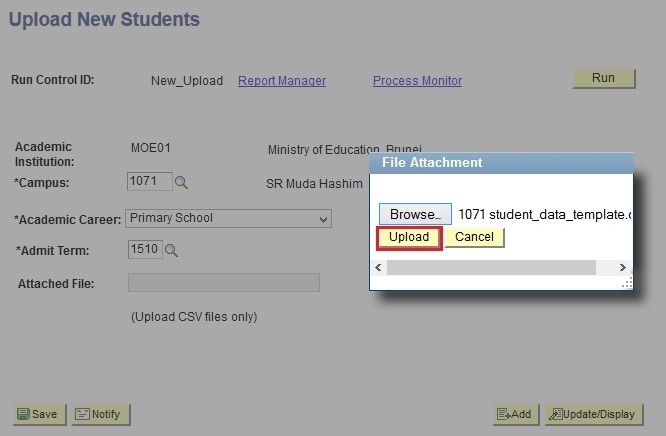 This function allows the users to upload student data into iNEIS™ system. 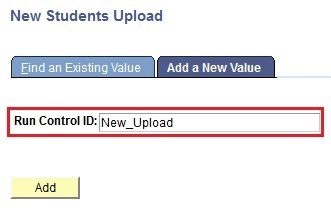 User is required to follow the instructions and use the student data template provided below to ensure that all student details follows the correct code. Click here to download the student data template. Click here to download or view the instructions. Navigate to Main menu > Student Admissions > Processing Applications > New Students Upload. Click on Add a New Values tab. Enter the Run Control ID, enter any value without spacing (e.g. new_student). 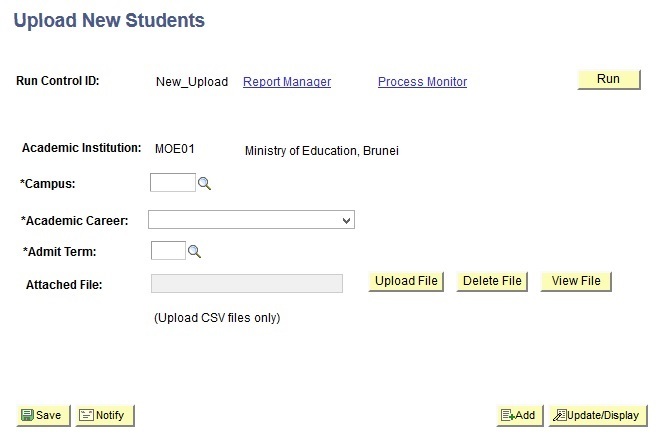 User will be directed to the Upload New Students page. 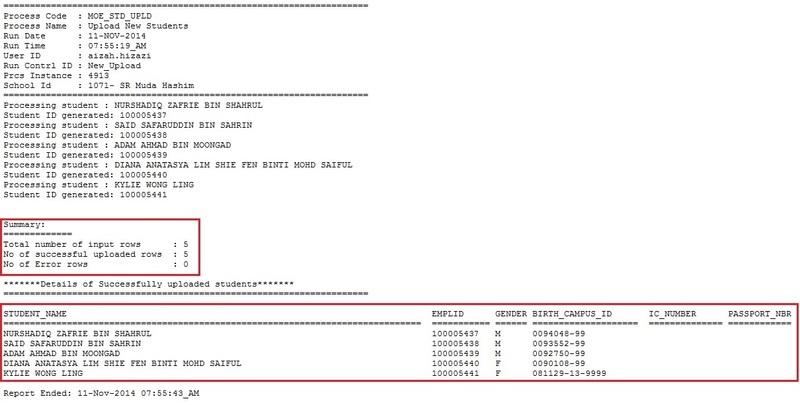 Click on the look-up button to view list of the Campus code and select the campus. User should only be able to enrol students into their own campus. Click on the drop down button and select the students’ Academic Career. 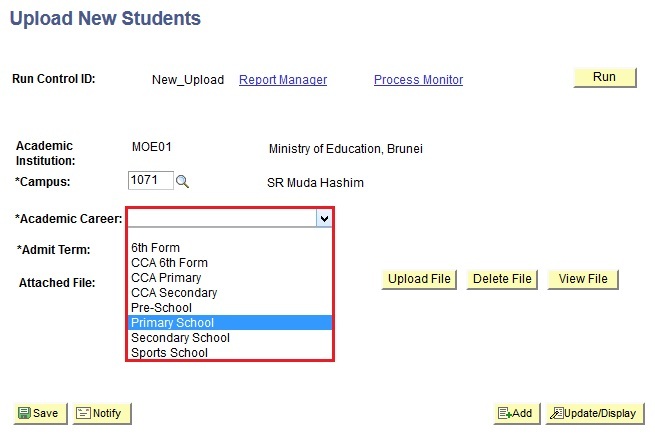 Click on the look-up button and select the Admit Term to which the students should be admitted. 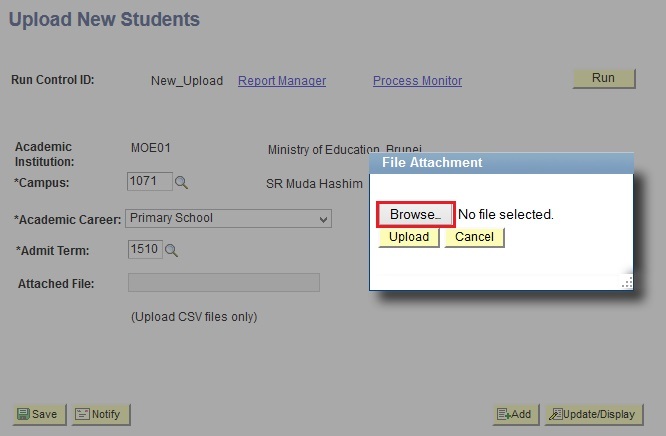 User should select the Admit Term in which the student first attended school. For e.g. New Student started school on 10 Jan 2015 which falls on term 1510. Hence student Admit Term should be 1510. 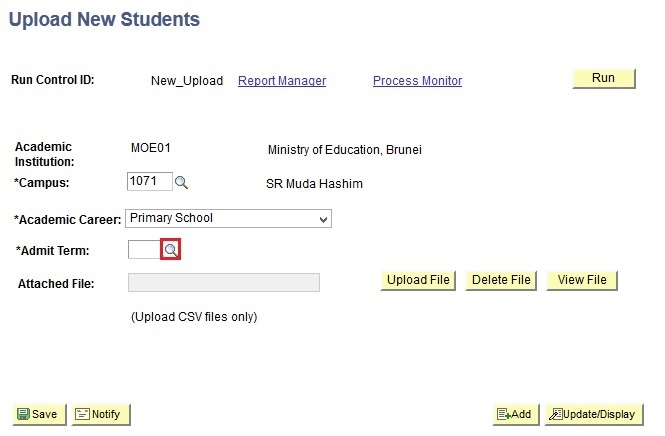 Click on Browse… button to search for the .csv file containing the students’ application details. User should only upload .csv file. 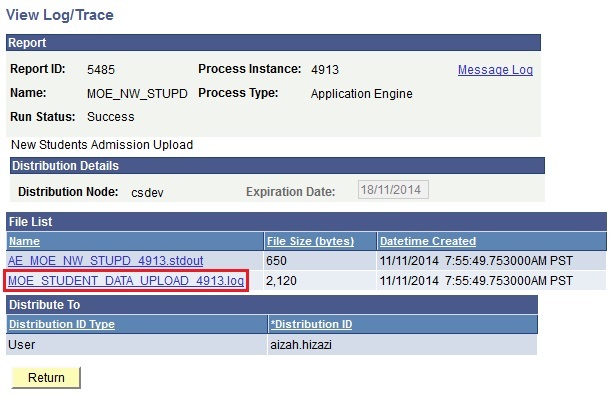 Click on the Upload button to attach the .csv file. 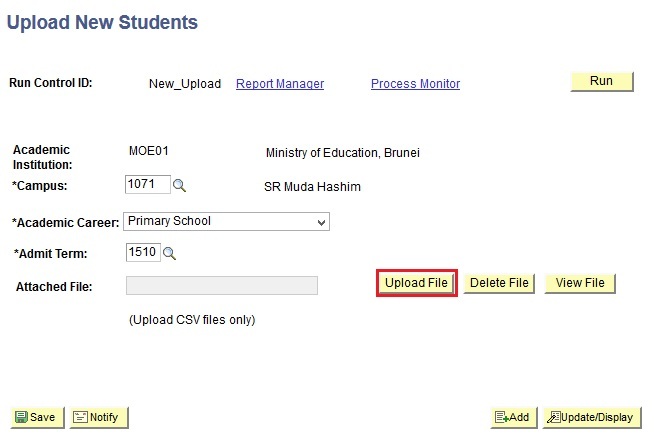 Click on the Run button to begin the students upload. 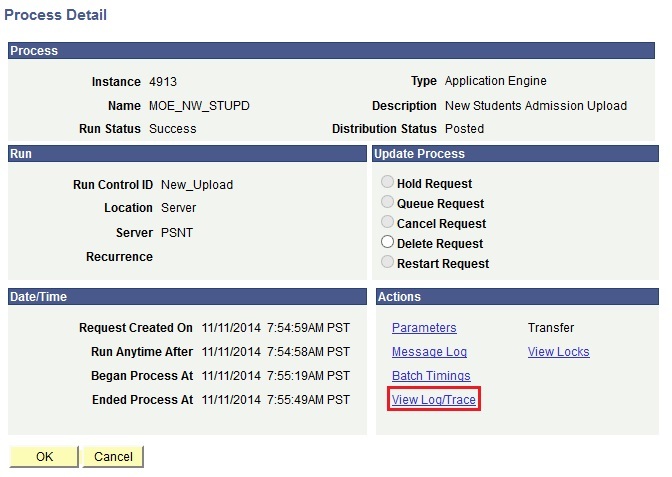 Ensure the process name New Students Admission Upload in Process Scheduler Request page is checked. 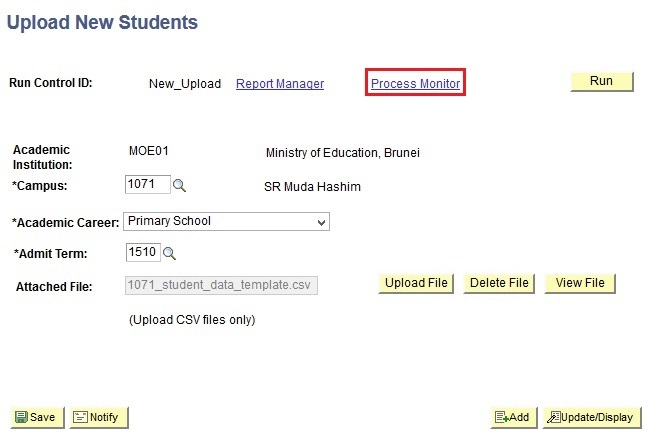 In the Upload New Students page, click on the Process Monitor link. User will be directed to Process List page and should be able to see that “Run Status: Queued and Distribution Status: N/A” for the process name MOE_NW_STUPD. Click on the Details link that is to the right of the process name MOE_NW_STUPD. In the View Log/Trace page, click on the .log link. 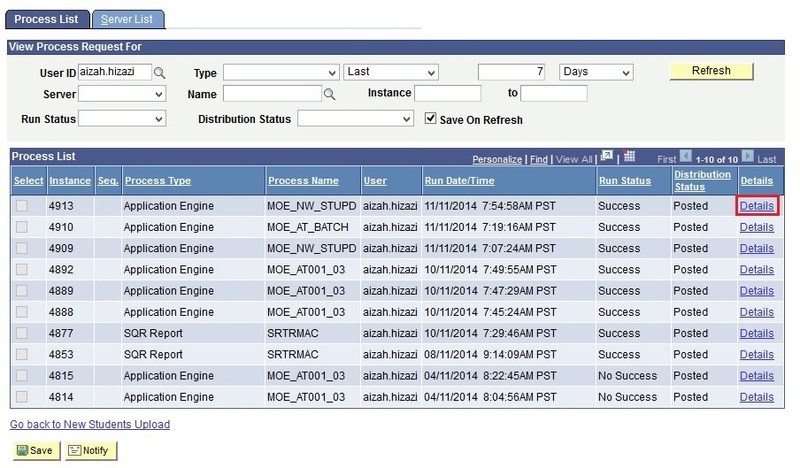 User will be directed to the log file page where the Total number of input rows, No. of successful uploaded rows, and No. of Error rows can be viewed under the Summary section. Below the summary section are the details of the successful students and the error details. Ensure that the total no. of input rows matches with the no. of rows in the .csv file.